Before an RF rhizotomy exam can be scheduled, it is important for our radiologists to verify the areas where the pain originates. Exams required to determine these areas might include MRI of the spine, facet nerve injections with local anesthetic (numbing medication) and steroid (anti-inflammatory medication), and possibly discography. A CDI technologist or nurse will contact you 24-48 hours prior to your appointment to review medications you are currently taking, especially pain medications and blood thinners, discuss known allergies and your medical history, as well as answer your questions. Please bring to CDI previous imaging study results (MRI, CT, x-rays) such as films, reports, or CD-ROMs, if available. Do not eat or drink anything 4 hours prior to your any procedure if you are receiving I.V. sedation. You will need someone to drive you home and stay with you for 12 hours post-procedure due to the effects sedation medications. Please make arrangements. Please notify a member of CDI’s staff if you are nursing or if there is a chance you may be pregnant. RF rhizotomy is an advanced injection procedure that is performed in our Ambulatory Surgery Center (ASC) suite, local surgery center, or standard DTI suite where we are able to offer I.V. sedation and monitoring by a nurse. If you choose to have sedation, once you arrive, you will have an I.V. needle placed in your arm so that you can receive the medication. You will be awake during the procedure to provide important feedback to the radiologist, but the sedative will help diminish anxiety and any discomfort. A radiologist will perform the procedure using a thin needle electrode placed adjacent to the degenerative facet joint. The radiologist will check the needle placement using a fluoroscope (x-ray camera), which is connected to a T.V. monitor. X-rays will be taken at this time. The radiologist will then use numbing medication (anesthetic) to put the nerve to sleep. 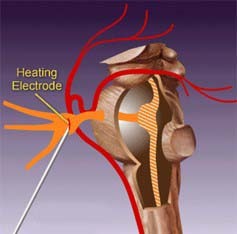 Then the radiologist will apply heat to the nerve via the electrode for approximately 60 seconds. This heat is designed to create a lesion, causing the nerve to become cauterized or burnt, which in turn breaks the communication link to the brain. This procedure is then repeated at other levels including the levels above and below where the pain is originating. Throughout the procedure, a radiologist and nurse will monitor your condition and comfort level closely. Due to the sedation, a nurse will review some guidelines that you will be asked to follow post-procedure (pertaining to driving, drinking alcoholic beverages, etc.). Once the local anesthetic effects have worn off, your usual symptoms may return and may be more severe for up to 5-7 days after the procedure. You should keep a record of symptoms following the procedure and report to the referring physician at your follow-up appointment. Patients must understand that approximately 10-12% of those people who have undergone RF procedures experience elevated pain for up to four weeks, rather than improvement. Improvement is usually noticed by the 2-3 week after the procedure. However, it may take up to four weeks before the beneficial effects of the rhizotomy are noted and a decrease in symptoms is realized.